Stumbled across this gem on a Gemini mix and fell in love with the acid drop mix. Always wrote off hip-house as a joke of a sub-genre and not too crazy bout acid house but this track manages to do the impossible and make it all work with a left field talking heads sample. Good stuff. Massive at every warehouse party in London back in '89,a true classic. The Hip Hop mix being the one to play. "JUST LETTING THE DAYS GO BY"! I first heard this Track on a Acid House Cd i got from the Super market back in 2006 . the Talking head samples sound excellent against the gugerling acid bass line & drums . I play the acid drop mix of this classic! The Acid Drop Mix on this is one of the finest examples of Acid House ever made, with a bassline as black and funky as possible that just builds, with the Roland TB303 filter opening right up as the track goes. With Talking Heads samples and a great philosophical political rap, "Planet E" is a timeless classic. This is as good as anything that ever came out of Chicago or Detroit. When I play the vinyl people still come and ask what it is to this day. Pigeon-holing genres is always dangerous as there is massive crossover. Hip-hop and rap artists saw the potential to release mixes that would be more accessible to djs playing the house style (and generate more sales). 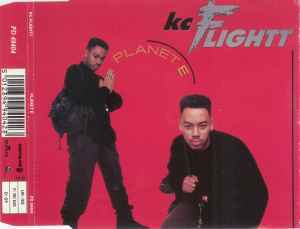 As a result, many releases (such as this KC Flightt piece) would have a straight hiphop breakbeat version with lyrics for the rap heads and a 4 to the floor bassdrum/kick mix for the house dj. Either way, this is a perfect example of the hip-house style: melodic lyrics, catchy bassline, and a driving 4/4 house theme throughout, in the same vein as Mellow Man Ace, Welcome to My Groove. The concept of "hip house" always seemed like an odd one to me but that's what some called it for a while in the UK. This track is great though, and would probably be classed as straight hip hop these days. I love the Talking Heads sample in the chorus.